Marvel UK's greatest asset... or biggest liability? 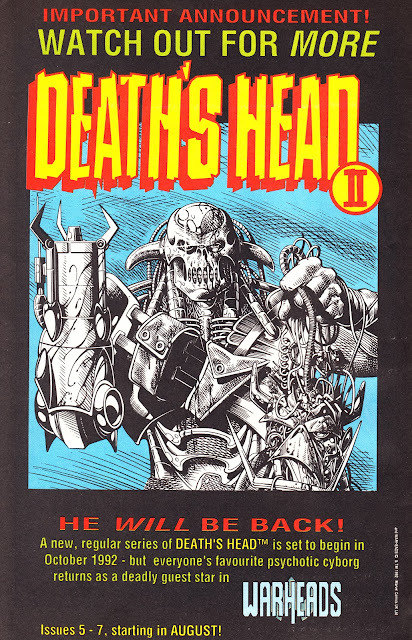 DEATH'S HEAD II was - by far- the most successful of the GENESIS 92 characters (thanks - in part - to his inclusion in the "Big Guns' promotion) which, unfortunately, led to a blitzkrieg of cameo appearances (and wannabe big muscles/ big guns characters) across the entire line (as well as a regular slot in OVERKILL). This is a house ad, from October 1992, trumpeting the launch of the DH II regular series which followed the successful four-issue mini-series. The run was curtailed - without warning - after 16 issues at the beginning of 1994 when Marvel London pulled-the-plug on the entire line. Inevitably - but not heralded in this ad - the first issues featured pointless sales-boosting appearances by The X-Men.